the client's documents on the system for you! Register as a Consultant and become part of an Elite Consultant Team. Don't know who is busy with work. Keeping everyone "Competent" and trained for the existing business processes. Recurring maintenance sheets and papers that needs to be signed. Keeping updated with documents clients are currently using. Internal audits are not scheduled or conducted; leading to product and or service lapses and you have to sort the problem out. Forced to update documentation yourself to prevent non-conformances. Non conformances reflects poorly on your service. Click here to view an example of how the system is used in a Manufacturing scenario. Personalised support from a knowledgeable and experienced ISO Consultant with an extensive background on the benefits and tools of the ISO Solved Solution. Experience our user friendly system to optimise your backoffice and empower clients to achieve more without constant support. Benefit from years of experience in the IT and ISO sector to simplify a tedious process with detailed reports and tools. Determine the optimum training solution to assist clients getting up and running as soon as possible; via workshop or onsite training. The system can be customised to look and feel like your company website to compliment your existing brand. WOW your clients by allowing them to experience the latest in Customer Relation Management Technology. You decide whether to solution as a dedicated system or to keep it on our cloud hosted platform. Documentation is accessible remotely. Start off by managing the changes to documents yourself and offer it as an additional service to clients once they are comfortable with the dynamic of the ISO system solution. Implement policies and procedures according to job activities and manage non-conformances by means of activity team leaders. This is an optimum solution to enable clients to manage risk. Alerts on upcoming client events in documentation ensures keeping to a pre-approved schedule. This is ideal for internal audits and management or performance reviews. Facilitate the collection of real time activities and events as daily proceedings to aid compliance. Getting and staying ISO Certified requires every employee to comply to the process; making it essential for each user to be logged and tracked according to performance. What does the client get? What is the basis of what your system provides? If I have a website, can I let the clients login for my own website? What do I as consultant get? How does your system help both the client and the consultant? How do I add a bucket? Can I view the buckets with the last comment for it on the bucket list? Can I order the buckets in the bucket list? How do I pass a bucket to a driver to deliver it? How does the driver work with buckets? 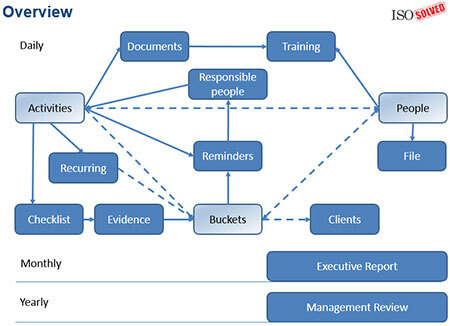 Is there a timesheet report for time spend on a bucket for a client? How do I change the priority of a bucket? Why can`t I view the buckets of all the other employees? Can I add a bucket under another bucket? Can the system alert me if I pass on a bucket and the if the person has not viewed or completed the bucket after 4 hours? The time displayed after I passed a bucket is wrong? How can I fix it? I take a picture as evidence on a bucket but it does not want to upload. What is wrong? How do I change my availability status on the system? Can I use my laptop rather than my phone to work on the website? Do you have an App or are you using browsers on the mobile phones? for making a decision or taking action. We owned and managed an internationally accredited company for 8 years. We issued more than 11 000 certificates a year. We developed and used our extensive IT experience to find solutions to these problems. Bottom line: our team of experts are waiting to help you effect these user friendly changes to get a step ahead. The clients cannot procure from the website without doing it through a registered consultant.